At last, there is a radial structure for 250 cc’s and over which combines good overall performance with optimal handleability over time². It comes out top of its category¹ for grip in the wet ensuring a safer ride and its sporty look is set to be a hit. Radial architecture gives incomparable stability and handleability. The sidewalls and tread are independent and therefore have specific characteristics: the sidewalls are flexible and offer greater comfort at high speed by cushioning road surface deformation. The tread, which is in contact with the ground, enables the tyre to grip the road. Its contact area is not as long as a bias tyre but wider and offers greater grip when cornering sharply on bends. The grip on wet roads has been recognized by the independent DEKRA Test Centre as being the best in its category¹. The 100% silica rubber compound makes all the difference on wet roads, an essential factor for sporty use in complete safety. Its excellent longevity² has been tested in Brazil by the independent organism, the MAUA Institute of Technology, in comparison with our competitors. The pressure in a radial tyre contact area is more evenly distributed which means that wear is ultimately more uniform with longer lasting high performance. 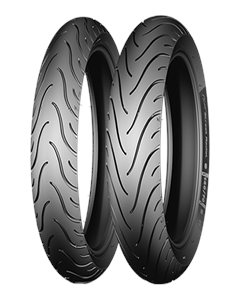 A tyre directly inspired by the Sport Touring radial ranges with a tread based on the MICHELIN Pilot Road 2 tyre: give your bike a smart, sporty look!